Intends to "leave no customer behind" as it evolves its product lines for an intelligent, cloud-based experience. 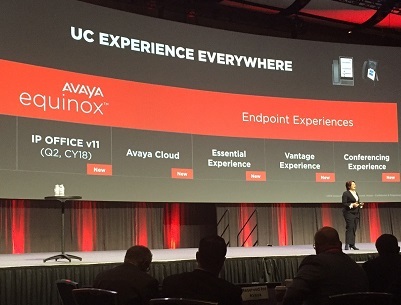 Avaya continued its parade of announcements yesterday at Engage, its customer and partner conference, with the artificial intelligence (AI)-supported customer experience and enhanced UC experience taking the spotlight. AI, as I wrote in a No Jitter post yesterday, is central to Avaya's go-forward strategy. In that vein, it introduced Avaya Ava, an AI architecture including natural language processing (NLP), machine learning, and what it calls "innovative analytics," with the goal of enabling "effortless customer engagement through social media and messaging platforms," the company stated in a press release. This is no "fake AI," as Jean Turgeon, VP and chief technologist at Avaya, defined as nothing more than bots during his mainstage presentation earlier this week. In that talk, Turgeon said AI today is victim of terminology abuse, and it needs to stop. A bot does not AI make, he said. Rather, a bot is a subset of AI capability. A true AI platform needs to look at machine learning and NLP, for example, he added. Ava, which began life automating help for Avaya online support, is now available as a cloud-based, messaging-agnostic AI-supported solution contact centers can use to add social messaging integration and automation of digital interactions. Avaya intends to integrate the voice-based AI capability, called intelligent wire, it'll gain with the Spoken Communications acquisition announced yesterday, Karen Hardy, Avaya product & solutions marketing lead, said from the keynote stage. But for now, Ava supports chatbot and messaging automation for Facebook, Line, Twitter, and WeChat, as well as support for 34 languages, she added. Ava features built-in AI mining, NLP, and sentiment analysis -- meeting that criteria for a true AI platform Turgeon had spelled out. Those functionalities allow Ava to "quickly understand, respond, and generate more efficient outcomes to answer questions for customers. It can also provide insights to agents as they start to handle interactions with those customers." And of course Ava follows Avaya's open API approach as embodied in the A.I.Connect developer program introduced last fall, said Hardy, citing IBM, eGain, Nuance, and Salesforce as integration partners (see related No Jitter post, "Avaya Unveils AI-Focused Developer Program"). While the Spoken and Ava announcements have the customer experience as their target, the business user experience is the focus of another set of enhancements. The goal on the business side is to deliver a "unified communications experience everywhere," and to allow employees "to mix and match across premises," Hardy said. Toward that end, Avaya is now making Equinox -- its converged communications, collaboration, and conferencing solution introduced in late 2016 -- available from the cloud. With availability of Equinox Meetings Online, "your employees are able to mix and match across premises and cloud for the same experience," Hardy said. For Equinox Meetings Online, Avaya offers WebRTC support for browser-based video and Web conferencing sans download, as well as app support on Android, iOS, Mac, and Windows devices. In addition, an interactive whiteboard capability brings enhanced collaboration and application sharing, Avaya said in its press release. In addition, Avaya is bringing Equinox capabilities to the midmarket IP Office platform, due in the second quarter, and is offering a new attendant feature that delivers advanced UC capabilities to front-end desk personnel. "The bottom line for unified communications is that we're making it easier for you to empower your employees, whatever platform you have today, whatever deployment model you're looking to have -- premises, hybrid, cloud -- with an experience that is consistent and connected," Hardy told the Engage crowd. "The focus is on making sure no customer gets left behind." Hear more from Avaya during an Industry Vision Address at Enterprise Connect 2018, March 12 to 15, in Orlando, Fla. Register now using the code NOJITTER to save an additional $200 off the Early Bird Pricing or get a free Expo Plus pass.